radiator, heater matrix and water pump. 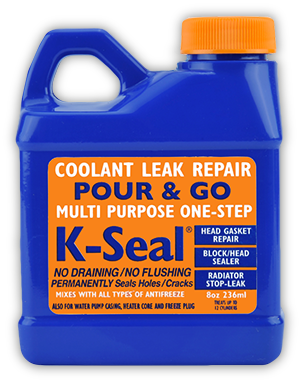 Coolant leaks don’t have to result in costly repair bills – simply add K-Seal to your coolant system for a quick and permanent fix. K-Seal is scientifically tested, trusted by millions of customers worldwide, and the only coolant leak repair fluid carried by the AA, the UK’s largest roadside repair company. K-Seal couldn’t be simpler to use. Just shake the bottle, add the fluid to your coolant system, and run your engine as normal. K-Seal’s unique formula will seek out holes and cracks, and permanently seal them, with no adverse impact on the efficiency of your engine cooling. If adding to the radiator do not pour directly onto the radiator core. K-Seal products are compatible with all types of antifreeze / coolant and are not affected by other additives that may already be in the cooling system. It does not matter if you add K-Seal products to a cold or hot engine but take care when working with a hot engine. For very small cooling systems e.g. motorbikes, it is possible to add just part of the bottle but you must make sure that the contents are extremely well mixed first. The quickest way is to take the vehicle for a gentle drive otherwise leave the engine idling until the temperature gauge reaches the normal level. Is K-Seal compatible with all types of coolant? Yes. K-Seal does not react with coolant or other additives that may already be present in the system. Is there any special preparation I need to do before using K-Seal? Unlike other block sealers, K-Seal is a simple ‘pour & go’ solution. Shake the bottle well and then add the entire contents to the cooling system where you would normally top up the coolant/water. How much K-Seal do I need? 1 standard bottle of K-Seal (236ml/8floz) will treat cooling systems with a capacity up to 20 litres (this covers motorbikes up to light commercial vehicles). For larger cooling systems use our Heavy Duty (472ml/16floz) size K-Seal.